Baltic Amber Teething Necklace Information. Learn from Amber Experts. Today, more than ever, parents are looking for natural ways to care for their children instead of reaching for over the counter or prescription drugs. Especially when it comes to teething, a perfectly natural event that marks various growth stages in childhood. As parents explore how to soothe and calm teething children and give them comfort during these very uncomfortable times, they often turn to one of the oldest, most widely used, and complete natural solution Baltic Amber Teething Necklace. For thousands of years, Baltic Amber has been recognized for its incredible healing properties and analgesic pain relief. Completely non toxic, natural Amber also supports the immune system which is especially important for children when their young bodies are still in development. So how does Baltic Amber provide such incredible relief? We're glad you asked that question! Over 45 million years ago, an organic substance known as Fossil Resin was produced by unique pine trees in a very large forest in Northern Europe. When the temperatures in the forest went from cold to much warmer, the trees exuded a "Sap" or "Resin" which became part of the earth around them. As waterways in that area grew in size and strength, the fossilized resin reached the bed of the Baltic Sea and subsequently drifted in varying shapes and sizes to the shores. First recorded in 460 BC, Amber became the most precious substance of its time as the ''gold'' of Lithuania, the messenger of ancient history to scientists (the resin having Inclusions of tiny insects and plants of that period), and a most unusual healing solution. The healing properties of Baltic Amber are attributed to its primary ingredient, Succinic Acid, which is mostly located in the surface layer of the Baltic Amber, and is an exceptionally powerful therapeutic healing agent. Nobel-prize winner Robert Koch, (1886), the pioneer of modern bacteriology, proved that Succinic Acid has a very positive influence on the human body. So how does Amber achieve its role as the primary natural solution to relieving teething pain in children? In order for Baltic Amber to perform its analgesic function, Amber Artisans designed Baltic Amber Teething Necklaces that could be worn comfortably and safely against the child's skin. When the skin warms the Amber, it begins to exude its healing properties providing not only pain relief but a calming effect. 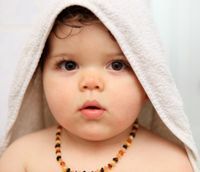 The relief will last for long periods of time so you can remove the necklace when your child is sleeping or unattended. The necklace fasten with a Screw Clasp and strung by hand with special knots in between each and every Amber bead so if the necklace should break, the rest of the beads will not scatter. IMPORTANT: Baltic Amber Teething Necklaces are made to wear but not to chew! Necklaces and bracelets should be removed when child is sleeping or unattended! So remember your child doesn't need to endure teething pain and the irritability that comes with it. At the first sign of teething, which is most often drooling, find a respected and reliable source for a Baltic Amber Teething Necklace. And then relax and let nature take its course.